Being prepared for a disaster is often the key to surviving one. Do 1 Thing is a web-based, twelve-month preparedness program that focuses on a different area of emergency preparedness each month. Emergency preparedness doesn’t have to be hard or expensive. Choose one of the easy “things to do” this month and Do that one thing! If you follow along for an entire year, you will be better prepared to handle most disasters and emergencies. You can jump in anytime and you don’t have to do things in any order! Do you have a NOAA Weather/All Hazards Radio ? Weather radios are “smoke detectors for danger.” A NOAA Weather Radio with an alarm and battery back-up is one of the best ways to protect your family, especially at night when the alarm feature can wake you up during severe weather and give you and your family time to seek appropriate shelter. 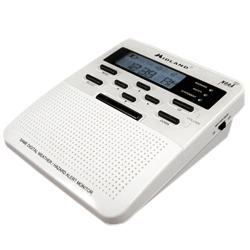 If there is no severe weather or emergency your radio can be switched to a silent, stand-by mode. The City of Waupaca is encouraging citizens to register for CodeRED. CodeRED is a telephone communication service that allows us to quickly notify citizens about emergency situations. All citizens and business are encouraged to register. Are You Ready for Breaking News? Breaking news alerts on emergencies and disasters as they happen. We send you situation reports and other important information from the State Emergency Operations Center. Severe weather alerts: Though our ReadyWarn system, we send Severe Thunderstorm Warnings as well as Tornado Watches and Warnings for the entire state of Wisconsin to your Facebook and Twitter account. These alerts can save your life and are especially helpful if you access Facebook and Twitter on a mobile device. Emergency preparedness information: We are providing emergency preparedness tips and information for a variety of natural disasters and man-made events. Learn what to do and where to go to keep your family safe. Press releases: Keep up to date on emergency management programs and initiatives. Blog postings from Wisconsin Emergency Management: We just launched a new blog with behind the scenes insights from Wisconsin Emergency Management staff.